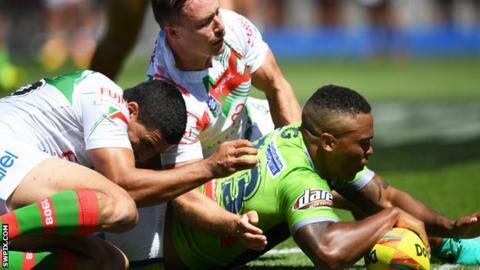 Huddersfield have signed Super League Grand Final-winning utility back Jordan Turner on a three-and-a-half-year deal after he was released by Canberra. The 28-year-old failed to make a appearance for the Australian side after joining on a two-year deal from St Helens at the start of the season. Turner, a title winner with Saints in 2014, did however play in the NRL All Stars game earlier this year. "I'm excited to be returning home to the UK with Huddersfield," he said. "Last year I took an opportunity that was given to me to head out to Canberra knowing how difficult it would be for me and my partner on the other side of the world and was keen to stick it out. "In the last few months I have had plenty of opportunities to return home but turned those chances down." Giants head coach Rick Stone said Turner comes in to replace Ryan Brierley who joined League One side Toronto in April. "We have been looking to fill a gap ever since Ryan moved on and I am delighted that our patience has been rewarded with such a good acquisition," Stone said. Turner, who played more than 100 times for Saints and also previously featured for Salford and Hull FC, joins a Huddersfield side third-from-bottom in Super League, with his deal announced after they were beaten 28-26 at Wakefield.